The Lower Platte North NRD continues progress on the Wahoo Creek Watershed Project. The project includes the planning, design, and development of 11 dam structures in the Wahoo Creek Watershed. In fall 2018, Olsson was hired by the Lower Platte North NRD to provide construction, permit, and design of sites 26a, 26b, and 27, as well as the design of the 8 remaining sites. Sites 26a, 26b, & 27 have been confirmed in the northern part of the watershed. These three sites in Saunders County are proposed future floodwater reduction dam structures to protect a county road and bridge. Site 27 is a proposed floodwater reduction dam approximately one and three quarters of a mile to the east of site 26a & 26b. The NRD is continuing to work with FYRA Engineering and NRCS to establish the proposed remaining 8 sites. Public scoping meetings were held on June 12, 2018 and March 20, 2019 to discuss the Wahoo Creek Watershed Plan-Environmental Assessment and the planned sites. The Wahoo Creek Watershed Project began in September 2017. Completion of sites 26a, 26b, and 27 are anticipated for 2022. The remaining 8 sites are tentatively expected to be completed ­­­2030. Please visit the FYRA Engineering project management page for more information. Lower Platte North NRD (LPNNRD), Nebraska Department of Environmental Quality (NDEQ), Nebraska Environmental Trust (NET), USDA Natural Resources Conservation Service (NRCS), FYRA Engineering, EA Engineering, JEO Consulting, and Olsson. 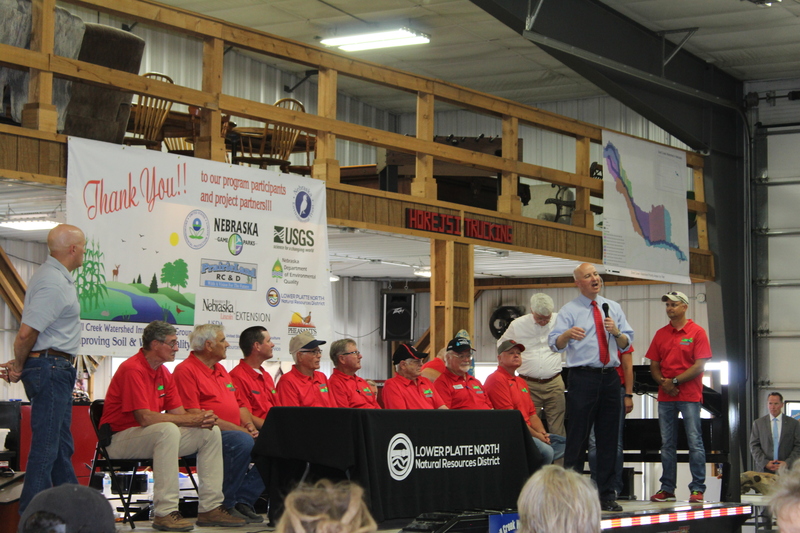 The Lower Platte North NRD has received additional grant funding through Nebraska Environmental Trust and NDEQ for Phase II of the Wahoo Creek Watershed Water Quality Plan. Environmental Trust has provided $106,000 in funds to support conservation projects in the Wahoo Creek Watershed. Additional funding is provided by NDEQ for $168,215. This funding will compliment special EQIP Water Quality Initiative funding through NRCS. The duration of Phase II is April 2016 to December 2018 and includes the four sub-watersheds of Cottonwood Creek, North Fork of Wahoo Creek, Dunlop Creek, and Miller Branch. Water quality standards are categorized as “impaired” due levels of E. coli bacteria higher than Nebraska’s Surface Water Quality Standards. Flood control is an additional concern to the Wahoo Creek Watershed. In 1998, the Lower Platte North NRD, the U.S. Department of Agriculture, ant the Natural Resources Conservation Service (NRCS) developed the Wahoo Creek Watershed Plan and Environmental Impact Statement to develop strategy for floodwater management and water quality improvement through the Wahoo Creek watershed. The plan was updated in 2013 to develop potential projects in the sub-watersheds with best management practices that are designed to reduce pollution levels that encourage water quality standards to be met. Various programs and practices have been designated as best management practices under Phase II of the plan. This includes the development of three potential wet detention basins, the stabilization of a grade control site in Dunlop Creek sub-watershed, encouragement of offering alternative watering sources for livestock, conversion to no-till practices, implementation of terraces, creation of buffer strips, crop production deferment, septic system upgrades, well abandonments, and various other practices. The additional funds from the Environmental Trust grant will provide more opportunities for cost-share assistance on various water quality and pollutant reduction projects in the Wahoo Creek Watershed. To have a project approved through a cost-share program, please contact the NRCS office at (402) 443-4106. The Lower Platte North NRD was a local partner with the City of Schuyler for a levee construction improvement project to reduce flooding from Shell Creek. Phase I of the project involves levees on a 2.5 mile stretch near Shell Creek north and east of Schuyler. The official groundbreaking for the project was held March 27, 2014, and major construction was completed in late 2014 with remaining work mostly completed in 2015. Construction and land rights costs for the project were $3.9 million, with 65% ($2.54 million) coming from the Corps and the remainder ($1.37 million) from the local partners. The Sand Creek Environmental Restoration Project is a multifaceted project that provides environmental restoration, flood control, and recreation benefits for the Sand Creek Watershed area in Saunders County. Lake Wanahoo is located one mile north of Wahoo, just west of the Highway 109/77 junction. The dam was completed in 2010, impounding a 662-acre lake (approximately seven times as large as nearby Czechland Lake at Prague, and just slightly smaller than Pawnee Lake near Emerald). The Lake Wanahoo State Recreation Area, managed by the Nebraska Game and Parks Commission, opened to the public in April 2012, offering fishing, hunting, camping, picnicking, day use, no-wake boating, disc golf, and more. The Lake Wanahoo/Sand Creek Project began in the early ’90s as an effort to help reduce severe flood problems on Sand and Wahoo creeks. Efforts to find solutions for the flood problems date back to at least the mid-1960s, and numerous reports and studies since then have confirmed the need for flood control in the area. However, little progress was made until 1990, when Wahoo and Saunders County approached the Lower Platte North NRD about the possibility of constructing a large reservoir just north of Wahoo. After preliminary studies indicated that the idea held promise, the project partners commissioned a more detailed feasibility study in 1996. That study, completed in June 1997, reaffirmed the merits of the plan and recommended that the project go forward. As the project progressed, it evolved into a broader-based watershed project focused on environmental restoration, with flood control and recreation as added benefits. Environmental restoration is the primary benefit of the Sand Creek Project. A large wetlands area at the north end of Lake Wanahoo, along with wetland areas around the seven upstream structures, will help mitigate wetland losses that have occurred in the Todd Valley over the years. The project will also create new wildlife habitat, restore native grassland and hardwood forest areas, and improve water quality in the watershed. Seven smaller dams were built upstream on Sand and Duck Creeks. Along with large wetlands at the north end of Lake Wanahoo, they will help trap sediment and nutrients before they reach the lake, preserving the water quality, creating wetlands, and extending the life of the lake. Funding assistance for these projects was provided by the US Army Corps of Engineers. The estimated total cost to construct the Lake Wanahoo/Sand Creek Project is $42 million. The major funding sources include $16 million of federal funding from the U.S. Army Corps of Engineers, $12.3 million from the Nebraska Resource Development fund (administered by Nebraska Department of Natural Resources), $3.8 million from Nebraska Department of Roads, $1.4 from Nebraska Game and Parks Commission, and $1.28 million from the Nebraska Environmental Trust with the remainder coming from the local partnership (the city of Wahoo, Saunders County, and the Lower Platte North NRD) . Land rights acquisition for Lake Wanahoo was completed in summer 2000. In the Water Resources Development Act passed later that year, the project was given “conditional approval” by the Corps of Engineers, which required additional studies and reports. Final approval was granted in January 2003, and the Project Cooperative Agreement was signed in April 2004. Work began on fishery structures in summer 2004. Construction on the wetlands phase of the Lake Wanahoo site (north of the lake) was completed in fall 2008. Work on a breakwater structure and the Lake Wanahoo dam embankment began in fall 2008 and was completed in 2009. Construction of the dam was finished in August 2010. Recreation facilities and five of the planned upstream dams were constructed in 2011-2012, and the Lake Wanahoo State Recreation Area opened to the public in April 2012. The seven upstream dams were completed in 2013. Mike Sotak and Bob Gregalunas prepared a recap on the hydrology and hydraulics study of Lake Wanahoo. This information was prepared to address water level and flooding concerns. Download the presentation here. Flood damage reduction is another benefit of the Lake Wanahoo/Sand Creek Project. The project should reduce flood damages in the Wahoo Creek watershed by at least 23 percent and help protect Wahoo, Ithaca, Ashland, and surrounding areas. Estimated annual savings from this flood protection are approximately $250,000. Recreation is also a benefit of Lake Wanahoo. The 662-acre lake and 1,777-acre recreation area is managed by the Nebraska Game and Parks Commission and is the largest body of water to open for public use in eastern Nebraska in at least two decades. The Shell Creek covers almost 110 miles, running through five different counties in Nebraska, and drains approximately 304,873 acres of surrounding farmland. Over the last 20 years, erosion has drastically affected the Shell Creek Watershed. Concerns about poor water quality and the erosion’s effect on agriculture production have been a primary concern for decades. The Shell Creek Watershed Improvement Group is a true demonstration of the influence that a group of local landowners can have on conservation. The grassroots efforts in collaborative conservation have led to the betterment of the entire watershed. Learn more here! The Shell Creek Watershed has seen significant improvements to the health of the watershed. In 2018, Shell Creek was officially de-listed for Atrazine from the Clean Water Act List of Impaired Waters by the Environmental Protection Agency (EPA). This is a historic and significant celebration, as this is the first time, not only in Nebraska, but in the nation for a stream to be removed from the list. More than 19 years of local conservation efforts and the implementation of a comprehensive watershed management plan led to this monumental success. Learn more about the celebration announcing the de-listing here. SCWIG prioritized education outreach to improve public awareness of the project and encourage conservation with best management practices. In 2002, Newman Grove High School and Schuyler Central High School became involved with the conservation efforts in the watershed, forming the Shell Creek Watershed Monitoring Program. High school students spend their summers collecting samples and measurement, analyzing data, and reporting results to determine water quality of the stream. Visit the Shell Creek Watershed Monitoring Program website to learn more about Newman Grove High School students’ involvement and efforts. The Shell Creek Watershed Improvement Group (SCWIG) was formed in 1999 with eight original members to discuss flood reduction projects, which evolved into the importance of land treatment projects. SCWIG worked with local landowners and producers in the watershed to identify and promote priority conservation practices and looked to the Lower Platte North NRD and the USDA NRCS to engage various agencies on the local, state, and federal level to provide additional assistance. More information on SCWIG can be found here. The Skull Creek Watershed Project is a multi-use project providing flood control and outdoor recreation in Butler and Saunders counties. In the mid-1980s, the Lower Platte North NRD began work on a project to alleviate flooding problems in the Skull Creek watershed. Skull Creek drains the northeast corner of Butler County and the extreme northwest corner of Saunders County before emptying into the Platte River between Linwood and Morse Bluff. In 1986, the Nebraska Natural Resources Commission (now the Department of Natural Resources, NDNR) approved a flood control project for Skull Creek involving three dams and a levee system. However, before they would commit funds for the project, NDNR required at least 75 percent of the land above the structure sites to be treated with terraces or other conservation measures to reduce soil erosion. Little progress was made in the next few years, and in 1989, the NRD and the Commission agreed to rethink the project. Two of the dam sites and the levee system were put on the back burner, and Site #55, one mile north of Bruno, became the focus of attention. Over the next 10 years, the NRD concentrated on meeting the requirement of 75% land treatment above Site #55. To speed land treatment work in the Skull Creek Watershed, the NRD began an aggressive cost-share assistance program in 1995. More than 20,000 feet of terrace and 9,000 feet of tile outlets were constructed, resulting in more than 75% of the watershed being considered treated or non-highly erodible land. The Nebraska Environmental Trust funded the majority of this work with two grants totaling $220,000. More than $55,000 of local and state cost-share funds were also used. Thanks to the accelerated land treatment program, the NRD achieved its goal of 75% land treatment above Skull Creek Site #55 (now known as Homestead Lake) in late 1998. In 1999, the Department of Natural Resources approved funds for the project. Seventy-five percent of the $792,471 project cost ($594,353) came from the Nebraska Resources Development Fund, with the remaining 25 percent ($198,118) coming from the NRD. The dam and recreation area were finished in spring 2001. Homestead Lake provides up to a 37-surface-acre reservoir with a flood pool of 92 acres. The structure helps protect Abie, Linwood and surrounding areas from flood damage. Estimates in 2001 showed that on average, Homestead Lake will prevent $40,000 in flooding damages each year over the projected 50-year life of the project. The site has also been developed for public recreation. The reservoir is open for fishing, picnicking, no-wake boating, in-season upland game hunting, camping, and other activities. Other proposed components of the Skull Creek Watershed Project — Sites #30 and #31 and a four-mile levee system — do not appear to be economically feasible at present, and the NRD will be not be pursuing them in the foreseeable future. Site #31 may be resurrected at some point in the future if cost/benefit ratios are favorable. 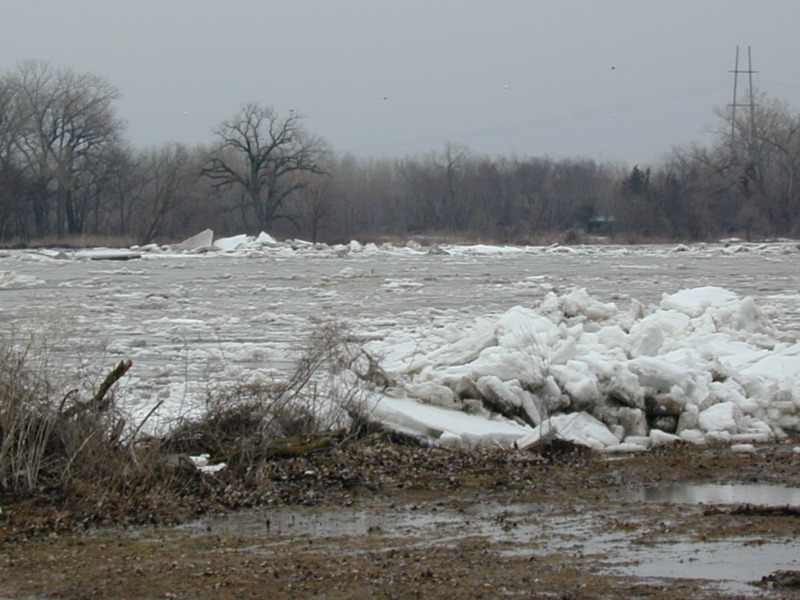 Spring ice jams have been a recurrent problem on the Lower Platte River, causing widespread flood damage to homes, businesses, and farmland. In 1993, flooding from an ice jam in the Ashland area closed Interstate 80 and local highways and endangered the National Guard Camp and the City of Lincoln’s wellfield. Existing levees provide some measure of protection against such floods, but they are not built to uniform standards. In cases where levees are built of different materials and to different heights on opposite sides of the river, or where one side has levees and the other does not, flood damage can be intensified on the less well-protected side. Along some segments of the river, levees on opposite sides are too close together, creating a bottleneck which can worsen floods downstream. The project involves improvements to 14 miles of levees on the Platte and Elkhorn Rivers in Sarpy and Saunders Counties. The levees will be made uniform along both sides of the river and will be able to withstand a 50-year flood once improvements are completed. Near Thomas Lakes (just south of where the Elkhorn joins the Platte), notches will be cut into an existing levee on the west side of the Platte, and a new levee will be constructed further back to remove a bottleneck. Further south, a levee was built around the Ashland National Guard Camp. Across the river, just north of the U.S. Highway 6 crossing, new levees will be constructed near the Beacon View housing development. Five homes will be directly affected by these new levees, and owners will be given the option of selling their homes to the project sponsors or having them moved to higher lots in the Beacon View area. Twenty-three other nearby homeowners will be given the option of selling their homes or having them raised to a safe elevation at their current locations. To mitigate the impact of the levee improvements on endangered species such as the least tern, the piping plover, and the pallid sturgeon, the project will also involve approximately $2 million worth of habitat restoration on the river. A short segment of new channel will be created on the river side of the new levee near Thomas Lakes, and an island in the center channel will be cleared for plover and tern habitat. The Western Sarpy-Clear Creek Levee Project is being sponsored on the Federal level by the U.S. Army Corps of Engineers. Local sponsors are the Lower Platte North, Lower Platte South, and Papio-Missouri River NRDs. The estimated project cost is $42 million. The U.S. Army Corps of Engineers will provide $8.6 million of the funding through the federal Water Resources Development Act (WRDA). The Nebraska Department of Natural Resources could provide up to 67 percent ($3.5 million) of the local costs through the Nebraska Resources Development Fund. The remaining $1.7 million will be split among the three natural resources districts (Papio-Missouri River NRD, $854,710; Lower Platte North NRD, $598,297; Lower Platte South NRD, $256,413). Project construction is scheduled to being in August 2002, with completion of all phases set for November 2004. Each winter and spring, the Lower Platte North NRD and its partners in the Platte River Ice Jam Agreement closely monitor conditions on the Lower Platte River so that ice jams can be dealt with in a timely manner to prevent flood damage. The group primarily focuses on the stretch of river from south of Fremont to Plattsmouth. In addition to the Lower Platte North NRD, the Ice Jam Agreement includes the Papio-Missouri River and Lower Platte South NRDs and Cass, Douglas, Sarpy, and Saunders counties. Each partner contributes to a reserve fund to help deal with potential ice jams. When conditions warrant, the reserve fund is used to hire licensed explosive contractors to blast jams loose. The NRD is also a partner in the Western Sarpy-Clear Creek Levee Project, which has extended and filled gaps in the levee system that protects Thomas Lakes, the Ashland National Guard Camp, the Lincoln well field, and more.